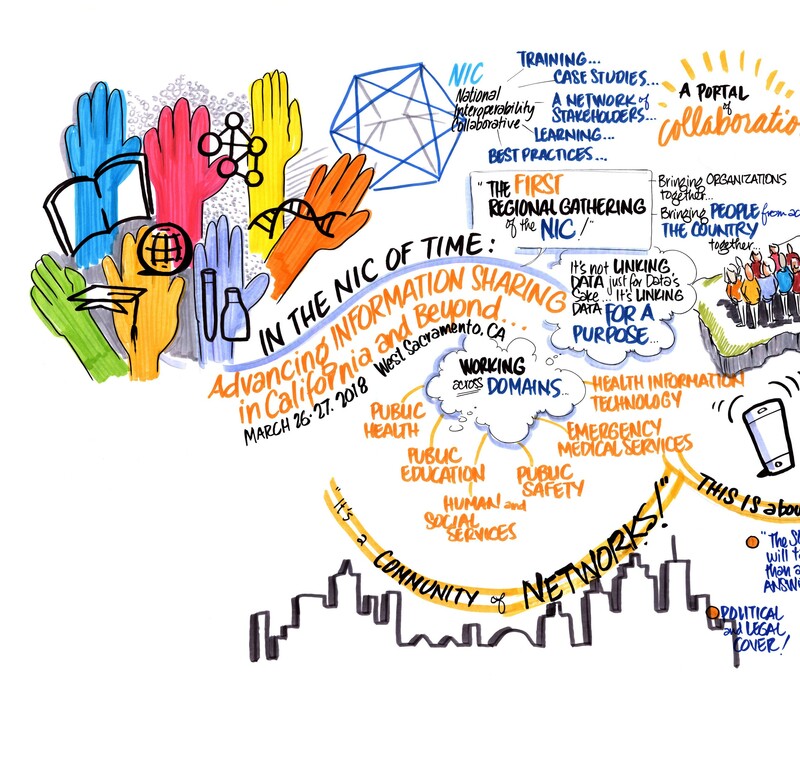 The National Interoperability Collaborative’s first major event – A Symposium in the NIC of Time: Advancing Information-Sharing in California and Beyond – took place at the West Sacramento Civic Center on March 26-27, 2018. 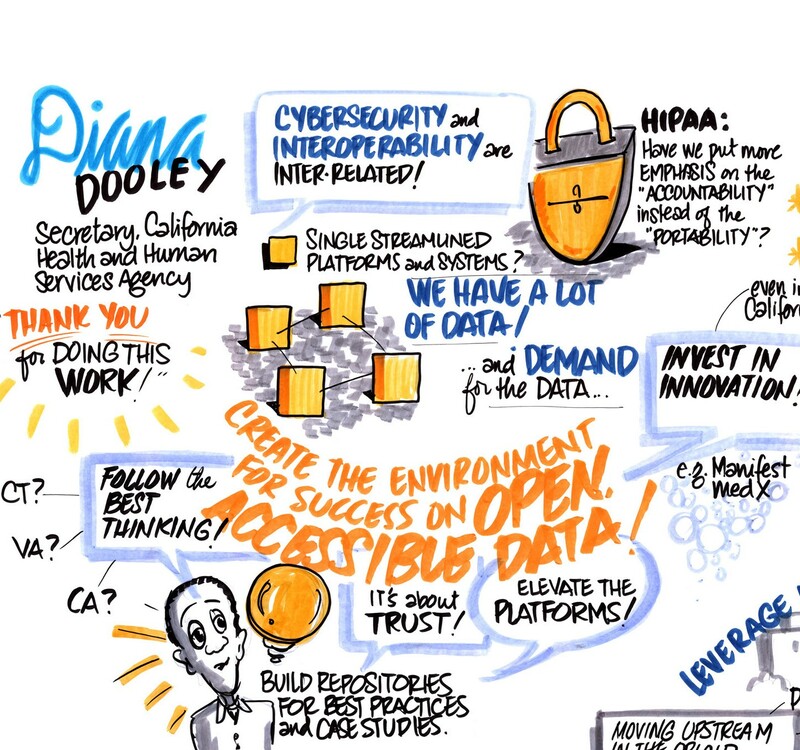 The invitation-only symposium was underwritten by the Chan Zuckerberg Initiative and was sponsored by NIC’s leadership team, Stewards of Change Institute and AcademyHealth, in partnership with the California Health and Human Services Agency and the Silicon Valley Regional Data Trust (SVRDT). 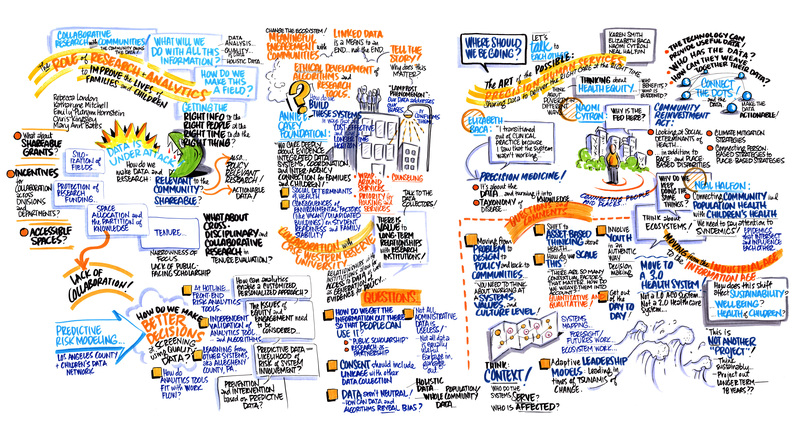 Resources have been posted – check the Session Matrix below for slides, murals and video! 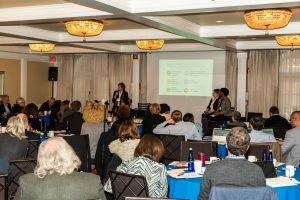 The 140 attendees heard about pioneering interoperability efforts across California, where NIC is building its initial statewide collaborative network, and in our other partner states (Connecticut and Virginia). 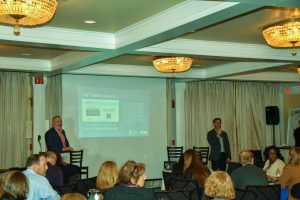 Among the highlights of the event was an ambitious multi-county, multi-domain information-sharing project currently being conducted by SVRDT, as well as innovative initiatives in San Diego, San Francisco and other project sites. Symposium participants were also connected to key programmatic and thought leaders from across the country – and learned about leading-edge activities, concepts, tools, and best practices – from across the six domains in which NIC primarily works to improve health and well-being by enhancing/advancing efficiency, interoperability goals, and most importantly, outcomes. Those six domains are: human and social services, public health, public education, public safety, emergency medical services, and health information technology. 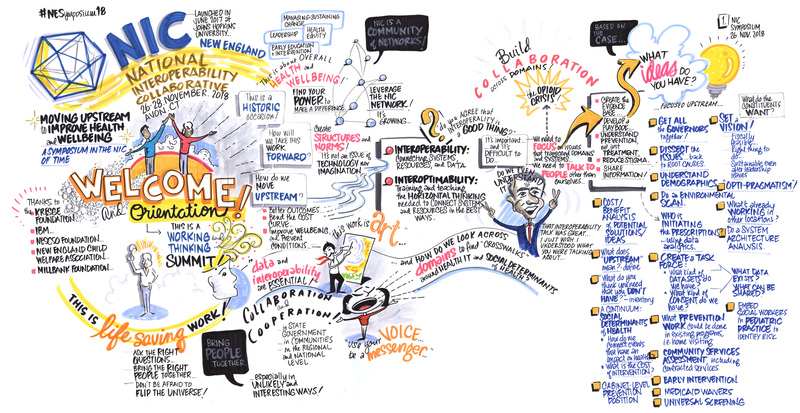 Please click the images below to access the symposium agenda and the full-scale versions of the 24-foot graphic murals captured at the event. In the Session Matrix below, you’ll find videos of the main sessions, excerpted graphic murals, PowerPoint presentations, documents distributed to attendees, output from interactive activities at the event, and other relevant materials. One of NIC’s distinguishing characteristics is its focus on cross-sector collaboration and learning across the six domains. Lessons learned in one area too often aren’t shared with any others, so organizations are forced to reinvent repeatedly or, worse, to make the same mistakes. Solving 21st century problems requires a multidisciplinary approach to incorporate all the factors that impact health, safety, and well-being. 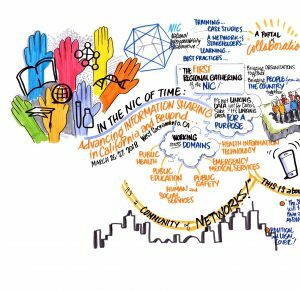 While valuable learning and networking around these issues occurred at the symposium, NIC also plans to synthesize the event’s output and publish a e-magazine soon, which we will disseminate broadly across the U.S.
We are very grateful to the organizations that have enabled NIC to make so much progress, so quickly: Kresge Foundation for providing the generous grant with which we are developing NIC; the Chan Zuckerberg Initiative for underwriting our California symposium; our other sponsors – IBM, Microsoft, and the Annie E. Casey Foundation – for their additional support; and the California Health and Human Services Agency for partnering with NIC and SVRDT in sponsoring the event. Most importantly, we thank everyone working with us to build NIC’s California “chapter” – and nationally. The presenters provide an overview of the mission, history, and organization of the Silicon Valley Regional Data Trust (SVRDT), a scalable model for improving educational, health, and human services outcomes and well-being for children and families. 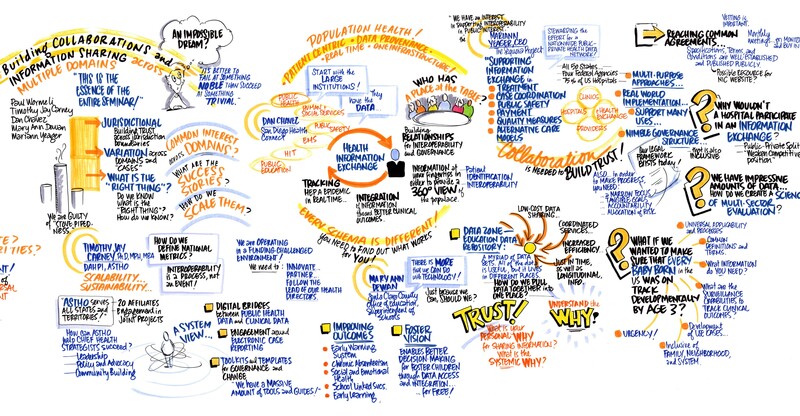 SVRDT provides a Secure Data Environment connecting public schools, health, and human service agencies in San Mateo, Santa Clara, and Santa Cruz Counties and the University of California, Santa Cruz. The presenters will describe the policy, legal, and technology architectures that underlie this trustbased system, and will demonstrate a prototype of SVRDT’s Secure Data Environment. Panelists will describe three current interoperability initiatives designed to better-address the opioid/heroin epidemic, including prevention, at every level: California’s diverse programs and projects statewide to enable a more-comprehensive approach; an Ohio county drug court’s testing of cognitive technology to aggregate multi-sector data and create a national model for the judiciary; and the New Jersey fusion center’s use of an information-sharing environment to improve the performance of local, county, and state law enforcement. The responder will focus on how these cross-sector initiatives might themselves be enhanced by connecting and sharing information with other relevant, interoperable systems as well as with NIC. Innovative interoperability and information-sharing efforts are growing around the U.S., and some are flourishing. This panel shines a spotlight on some successful initiatives, such as Live Well San Diego; an integrated and comprehensive client view in Santa Clara County; the Enterprise Integrated Case Management System in Montgomery County, MD; and a new platform to support national implementation of My Brother’s Keeper. Panelists will discuss what they’re learning and how their lessons can be applied; will inform NIC’s statewide development in California; and will suggest tools to promote further progress in collaboration more broadly. Day One closing remarks made by Jessica P. Kahn, MPH, Senior Expert, McKinsey & Company and Daniel Stein, President, SOCI; Co-Principal Investigator, NIC. Daniel Stein, SOCI/NIC, kicks off Day Two of the NIC Symposium. The concept – and realization – that cross-sector collaborations and networks can greatly enhance effectiveness, efficiency, and outcomes is hardly new. Indeed, many successful initiatives employing information-sharing and interoperability have been launched during the last decade, and they have much to teach us. In this presentation, thought and practice leaders discuss the nuts, bolts, challenges, and lessons learned in furthering their respective organizations, providing insights for attendees in their own work, as well as for NIC to leverage in building its new Community of Networks. 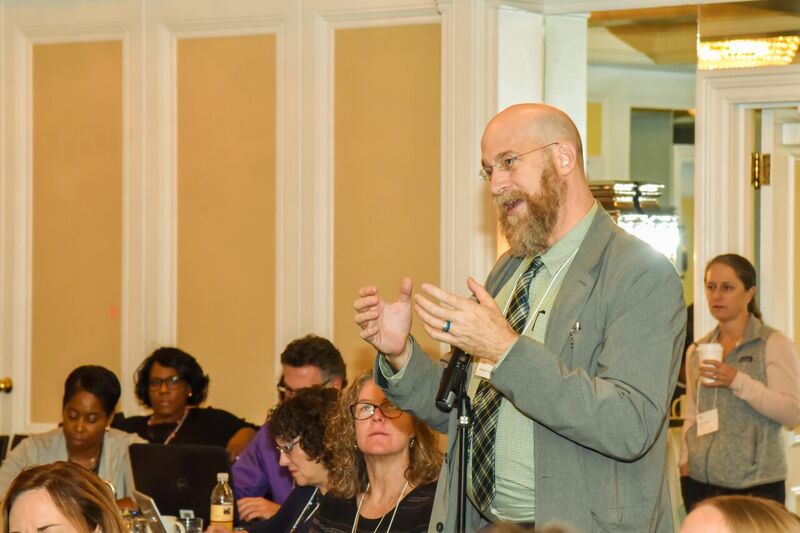 These presentations will provide an overview of the progress NIC has made over the nine months since it was launched at the Stewards of Change Institute’s 12th Annual National Symposium. Attendees will learn about the projects in which NIC is involved – in California and beyond – and will get a first look at NIC’s new website, its collaboration portal, and the initial module of its InterOptimability Training and Certification Curriculum (ITCC) program. Attendees will also hear about NIC’s plans for the future, and how they can become involved. 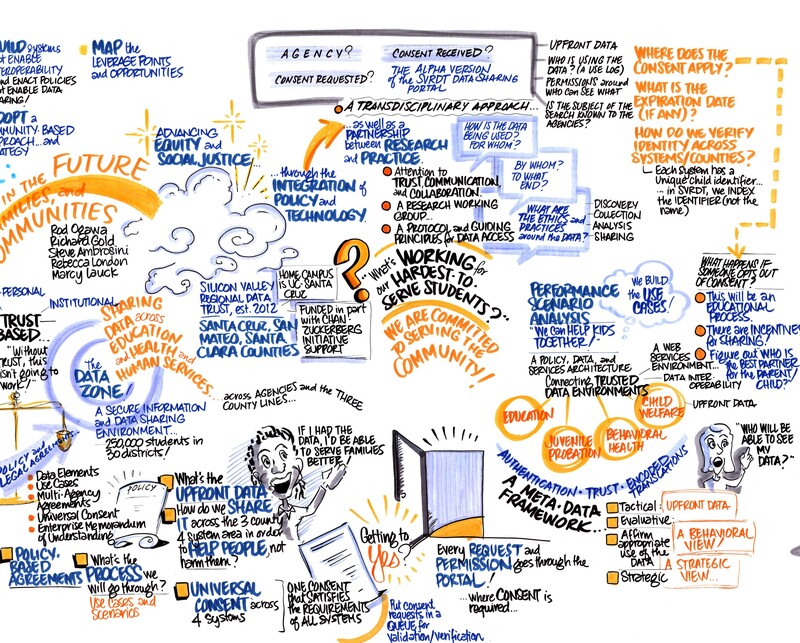 Data-interoperability and information-sharing efforts are complex and challenging, but a series of promising practices is beginning to emerge. This presentation will report findings from an environmental scan by AcademyHealth (NIC’s leadership partner, with SOCI) that includes interviews with interoperability experts, a review of interoperability guidance documents and toolkits, and identifi cation of themes and gaps in guidance that NIC plans to address. 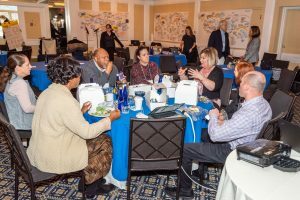 “Person-centered care” is being refined and redefined as a result of innovative information-sharing initiatives in California and around the country. Today, the goal is not only to ensure that every individual’s specific circumstances are being addressed holistically, but also to integrate the gamut of available data relating to the social factors that impact health and well-being. This session will explore promising near- and longer-term opportunities to improve the way our systems share information and deliver care more effectively and efficiently. 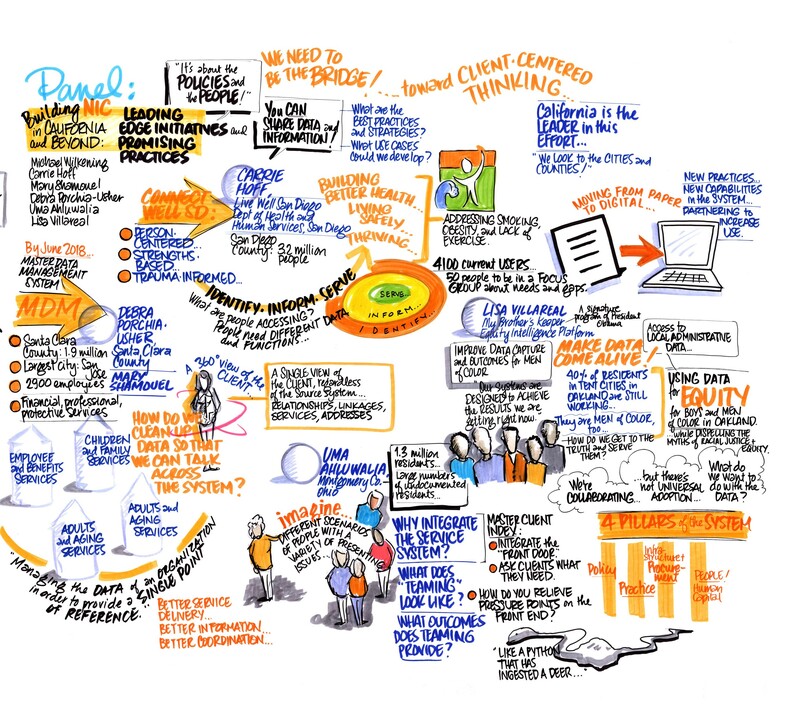 Check out more murals highlighting key takeaways in the resources matrix below. “A Symposium in the NIC of Time: Moving Upstream to Improve Health and Well-Being” convened a select group of senior officials, thought leaders, luminaries and subject-matter experts from New England and other parts of the country where NIC is currently working. 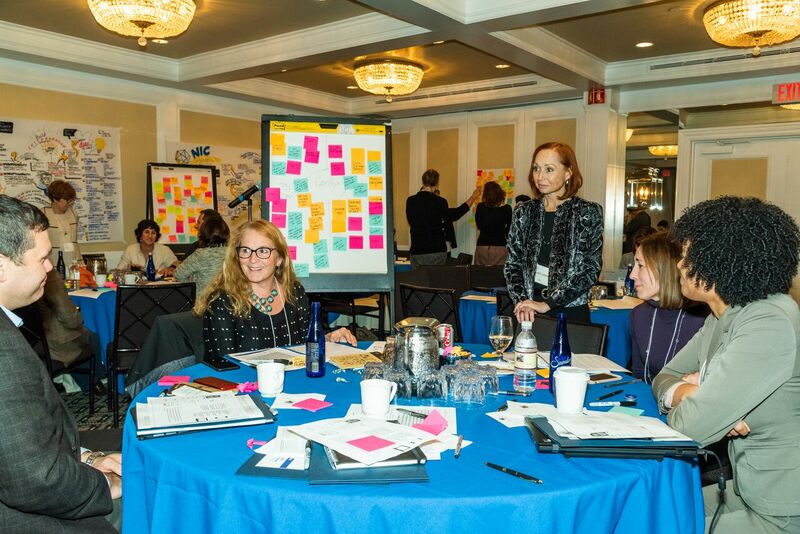 Participants also included NIC’s federal and Region 1 collaborators from the Administration for Children and Families and the Centers for Medicare and Medicaid Services. The event was organized by NIC and the New England States Consortium Systems Organization, with the support of the Kresge Foundation, IBM, the Connecticut Department of Social Services, the New England Association of Child Welfare Commissioners and Directors and the Milbank Memorial Fund. The symposium “faculty” included prominent leaders in the field, including Connecticut DSS Commissioner Rod Bremby, California HHS Secretary Michael Wilkening and former Virginia Health and Human Resources Secretary Bill Hazel, MD; federal ACF officials leading the agency’s new Interoperability Action Plan; and highly regarded academics from MIT, Yale and UC San Francisco. Additional participants include thought-leaders such as Jessica Kahn, Senior Expert from McKinsey & Co; John Ohanian, CEO of San Diego County’s renowned 211 community-information exchange; Rhea Boyd, MD, Director of Equity and Justice for Children’s Trust – all of whom helped to make the event a particularly rewarding experience. Our broad strategic thinking at the symposium was grounded in real-life case study examples that demonstrated the critical importance of better integration, data-sharing and interoperability – with a particular focus on collaborations within and across NIC’s six primary domains: human services, public health, public education, public safety, emergency medical services and health information technology. 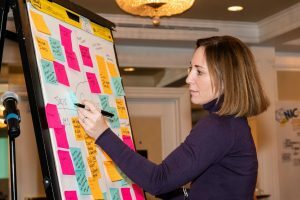 Information at the symposium was shared through diverse presentation formats and interactive activities that engaged participants in meaningful discussion, ideation and planning. 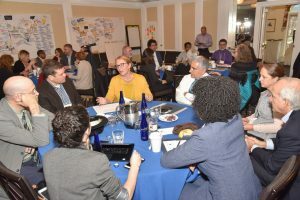 The use cases included new early childhood programs that are integrating early intervention from health and human services; prevention models in child welfare that reduce opioid use disorder and addiction; and upstream strategies that integrate two-generation models and the social determinants of health and well-being by leveraging existing and new technology. All of the diverse presentations had a singular goal: improving the lives and experiences of the people we serve. A comprehensive new report examines a broad range of evidence and issues relating to health care in Canada, with insights and recommendations on reforms designed to bring that country’s health-related systems into the 21st Century. 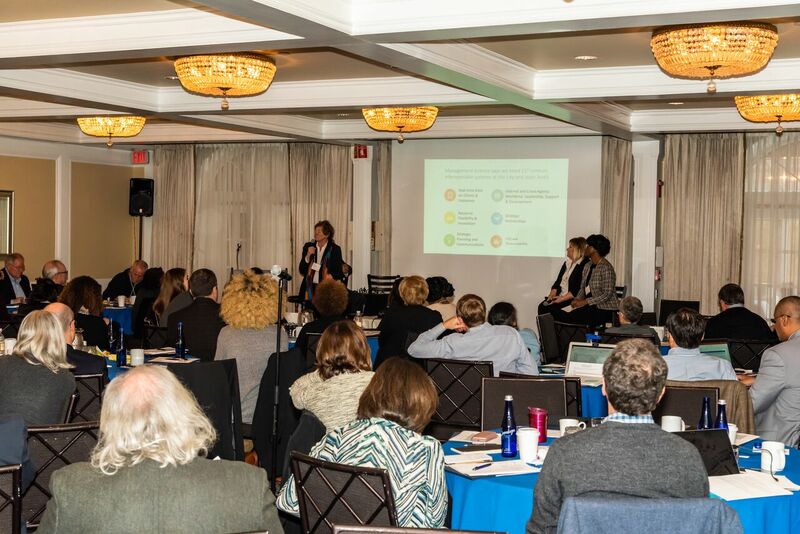 In this webinar, two of the report’s authors explained its findings, the importance of the social determinants of health and well-being to its prospects for success, and how its content is relevant to the U.S. as it considers next steps for the ACA, and perhaps life without it. Our third presenter applied the learnings from Canada to the current US health and hospital environment, with insights regarding the implications for improving efficacy and efficiency. Register to participate on the NIC Collaboration and Communication Hub. Once your Hub membership is approved, hit the “Join us!” button in the Social Determinants of Health Group. After the webinar, continue using the Group to connect with peers and keep the discussion going about the Social Determinants. On social media, spread the word about your participation in the webinar, using the hashtag #SDwebinar18. 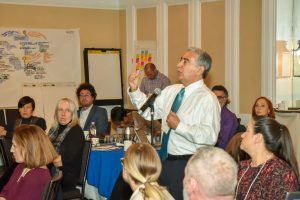 We’ve designed these presentations to go beyond the traditional webinar format in order to expand the opportunity for ongoing learning and facilitate networking with others interested in the topic of the event. There are two unique aspects to our “Deeper Dive” webinar-plus series, using the new Collaboration and Communication Hub. Before each webinar, we’ll publish a blog that includes key discussion points relating to the subject being examined. 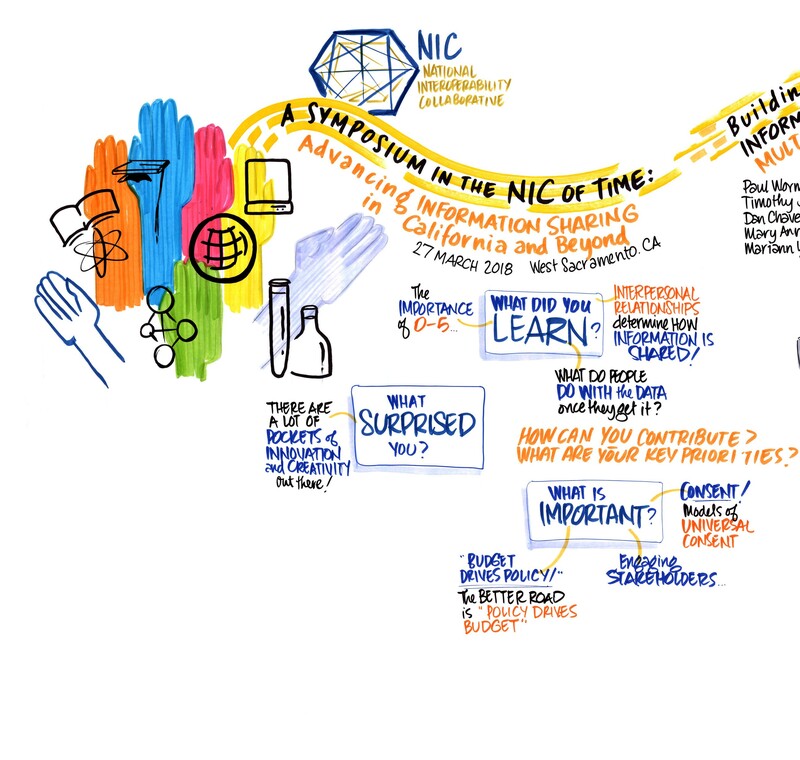 Readers will be invited to go to the NIC Hubto ask questions, offer insights and engage in discussions that extend the learning from the blog and inform the webinar’s content. Q&A will begin on the webinar platform after presentations, but the learning won’t end there. Rather, attendees can continue interacting with our expert presenters – and to engage in an ongoing conversation with other attendees/colleagues – by jumping to the NIC Hub. Our webinar-plus series takes a different approach because it aims for a different outcome. It is designed to be an integral part of an ongoing, action-oriented agenda to advance interoperability and data-sharing. 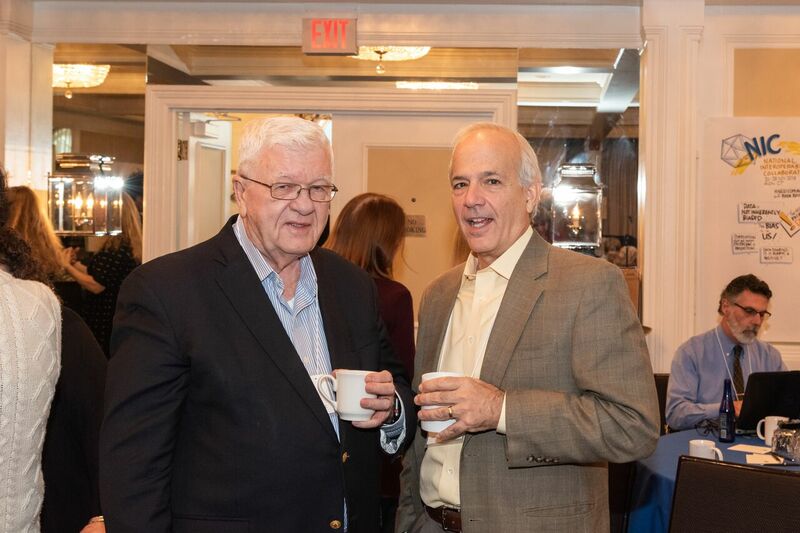 The objective of all of NIC’s work is to provide the information, tools and other resources needed to improve systems and increase collaboration among the multiple domains that impact health and well-being. Learn more about the primary domains in which NIC works. If you have any questions or comments, write to nic@stewardsofchange.org.